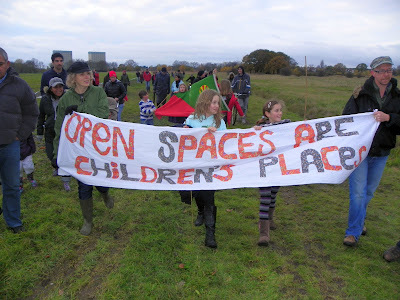 On Friday, the police finally submitted their application for the Olympic operations base they plan to construct in 2012, so it was definitely the right time for local people to 'Take Back Wanstead Flats' and remind the Metropolitan Police and the City of London Corporation who the land really belongs to. 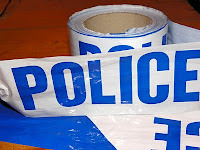 It's amazing what you can buy on the internet - such as one kilometre (I'm not kidding) of 'Police Do Not Cross' tape, for example - see right. Starting at around 11.30am, a group of us met up on the west side of the Flats and with gardening canes and our new rolls of tape, we marked out the boundaries of the planned police base, so that everyone could have their first opportunity to see how much space that Fortress Wanstead Flats would occupy if the Met's proposals are allowed to go ahead. And it's absolutely vast - a massive area of public land that will be enclosed by a solid 11 foot high wall. Early on, we realised we were being watched from a distance by two police officers in a Land Rover and a couple of us made a point of speaking to them to find out what they wanted. An officer called PC Snowden, whose card says he is from something called the 'Olympic Site Support Unit' (and who I've since been told has a background in 'forward intelligence') said they had seen today's event advertised "by anarchist groups involved in the student protest", naming the Whitechapel Anarchist Group and its tiny membership in particular. Frankly it's laughable - but this is how far the 'domestic extremist' agenda has now come. If the police are turning up to a local residents' protest because of something they have seen on a website, it's obvious that 'anarchists' are now firmly back in the frame for close surveillance. 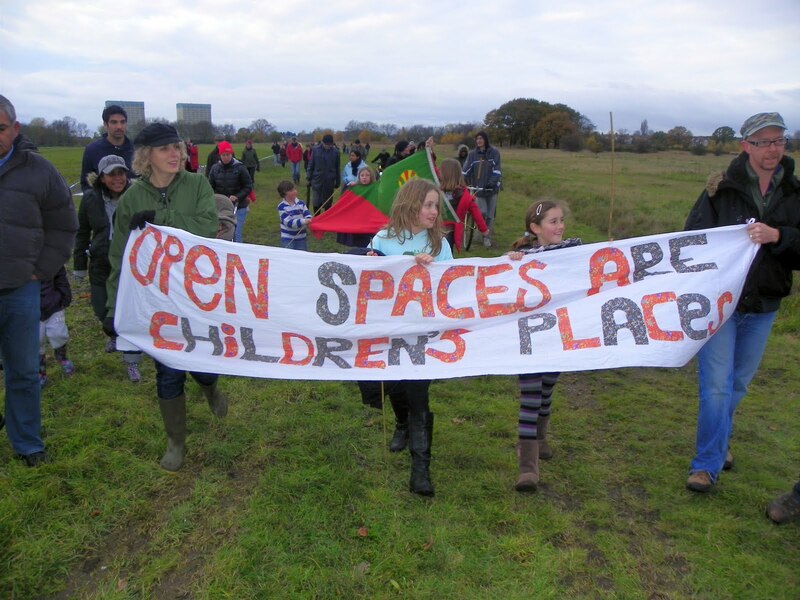 The two officers today seemed satisfied that there were no scary anarchos around - if only they'd realised the sterling support provided to the Save Wanstead Flats campaign by members of Action East End... or my own political sympathies, for that matter. 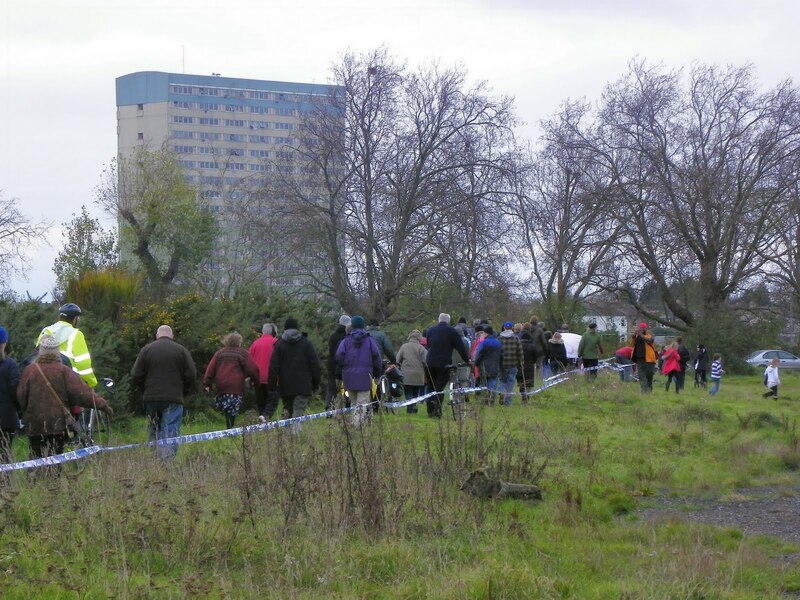 By about 2.30pm, around a hundred residents had gathered and together we walked around our freshly cordoned-off area, 'beating the bounds' in the ancient custom to protect the land. We returned for free baked potatoes and a 'Residents versus Coppers' tug-of-war contest - which as there was such a marked reluctance to don a policeman's helmet and join the 'Coppers' team, was won decisively by residents. 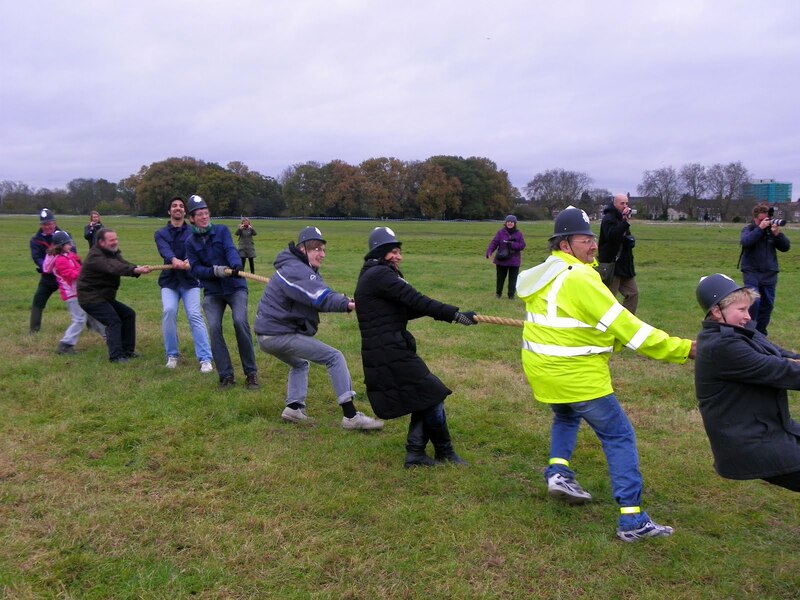 I'm now completely exhausted, but today has been enormous fun and another chance for those who care about the future of Wanstead Flats to gather together in its defence. Over the next few weeks, the priority has to be to encourage as many local people as possible to submit objections to the Metropolitan Police's proposals. The planning process is handled by Redbridge council and the application is available online at http://bit.ly/wansteadflatsplanning. The campaign intends to produce a briefing on making an objection, which will be available at the end of the coming week. Then Fitwatch may be interested in a report.